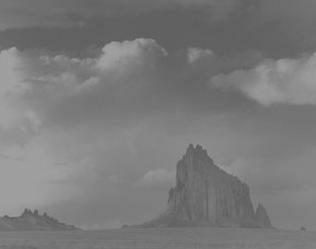 Called "Tse Bida' hi" (Rock with Wings) by the Navajo people, Shiprock is a 1700-foot high rock pillar, the eroded core of an ancient volcano. It is several miles west of Highway 666 in northwestern New Mexico. The Navajo have three legends to explain the origin of this landmark, considered by them to be sacred. The Navajo crossed a narrow sea beyond the setting sun and landed among an unfriendly people, which caused the Great Spirit to send a stone ship to carry them to this spot. The Navajo were brought by a great bird, who was turned to stone when it landed. The Navajo were cast up from the underworld and the great stone ship was placed at the spot to remind them of their voyage. Whatever the case, it is truly a majestic sight, especially seen up close. This poem is an attempt to express my own feelings as I visited this spot. All material on this page copyright �2000 Daniel Birch. No material may be downloaded, copied, or otherwise reproduced without express permission of the author.